From 1961 to 1973, the United States again fought Communist forces, this time in the Vietnam War. 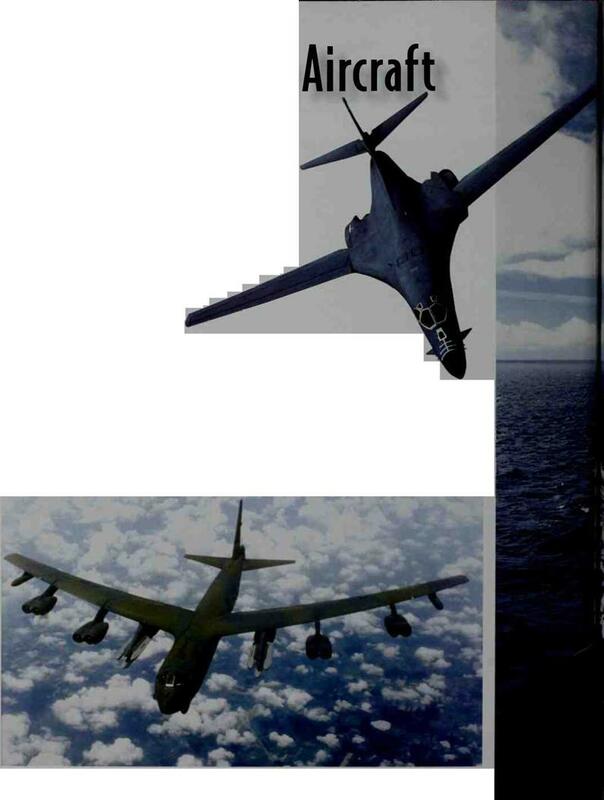 U. S. bombers dropped more tons of bombs in ill is war than both sides dropped in World. War II. I lehcopters played a critical role in Vietnam. Powerful helicopter gunships attacked the enemy and transported troops and supplies to the steamy jungle battle grounds. Helicopters also zoomed in to rescue wounded soldiers and downed pilots from behind enemy lines. Mechanics in Okinawa check a captured MiG-15 repainted with U. S. Air Force markings in 1953.Test pilots who flew this MiG said that overall, the F-86 was a better plane. With jets’faster speed, pilots no longer bailed out. This Navy pilot springs from his plane in an ejection seat. A parachute will open to land him safely on the ground. The interior of the Sikorsky HH-3E helicopter (right) was a welcome sight to many U. S. fighter pilots in Vietnam. Armed with heavy guns, the chopper flew in to rescue pilots downed in battle. It flew wounded men to base hospitals. Painted in olive green camouflage, the Sikorsky НИ ЗЕ was a large, powerful helicopter affectionately called the "Jolly Green Giant." A beacon of hope for stranded soldiers as well as pilots, it saved many lives in the war. Flying night reconnaissance, an F-4 Phantom II fighter crosses Vietnam in this painting. Able to race twice the speed of sound, the F-4 was a versatile plane. The first jet to find and destroy targets by radar without ground support, it excelled in dogfights with MiG-21 jets and also served as a bomber. Laden with bombs, two F-105D Thunderchief fighter-bombers head toward targets. 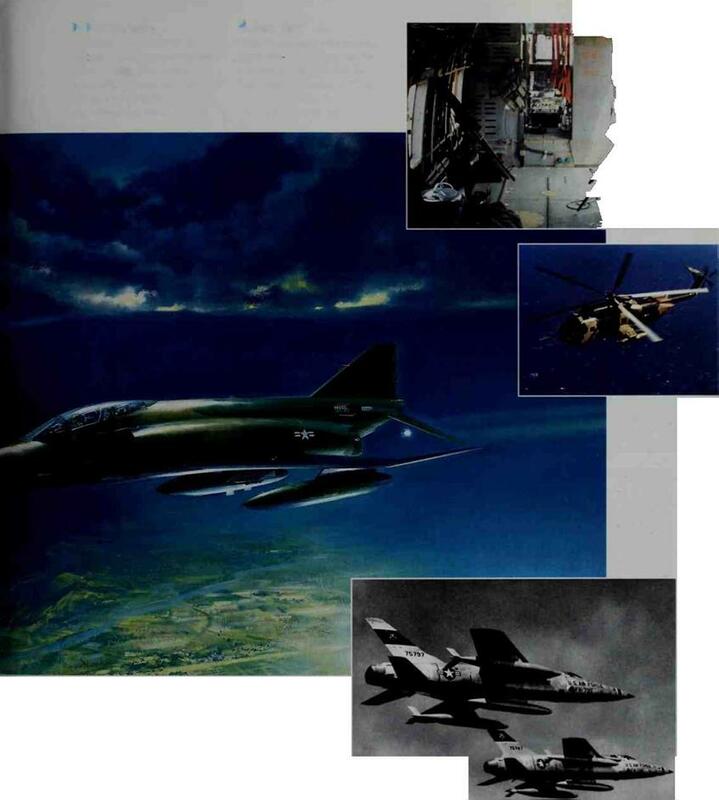 The F-105D could carry over 12,000 pounds ofbombs. lt flew a large number of air strikes in Vietnam. As a fighter, it could deliver an amazing six thousand rounds of cannon fire per minute. and advanced military aircraft. The development of more sophisticated technology in radar, navigation, and weapons systems has produced faster, stronger, and more complex jet fighters and bombers. In a launch, a catapult hurls the plane from a standstill to a speed of 200 miles an hour in the air. Strong arresting cables on deck help the jets land safely. The jets have a tailhook to snag the cables as they kind. Modern carriers, up to 1,100 leet long, are like floating air bases. They may carry’ nearly’ 100 planes. These carrier-based aircraft have been active in conflicts and peacekeeping from Vietnam to the present. S 3B Vikings, EA-6B Prowlers, and E -2C Hawkeye AWACS surveillance planes. An AV-88 Harrier"jump jet" (top) lifts straight up iri a vertical takeoff. Its jet nozzles can be directed to take of*, nover, or land like a helicopter or fly straight ahead. 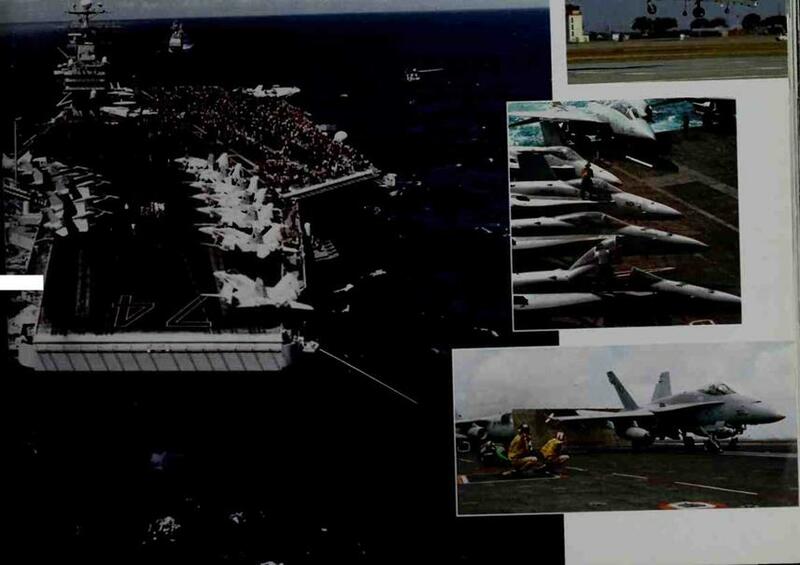 F-18 Hornet fighters (center) line an aircraft carrier deck. Bottom, a Hornet launches from the deck.